Finally a pasta dish again! I cannot believe I haven’t published a recipe for pasta in a while! 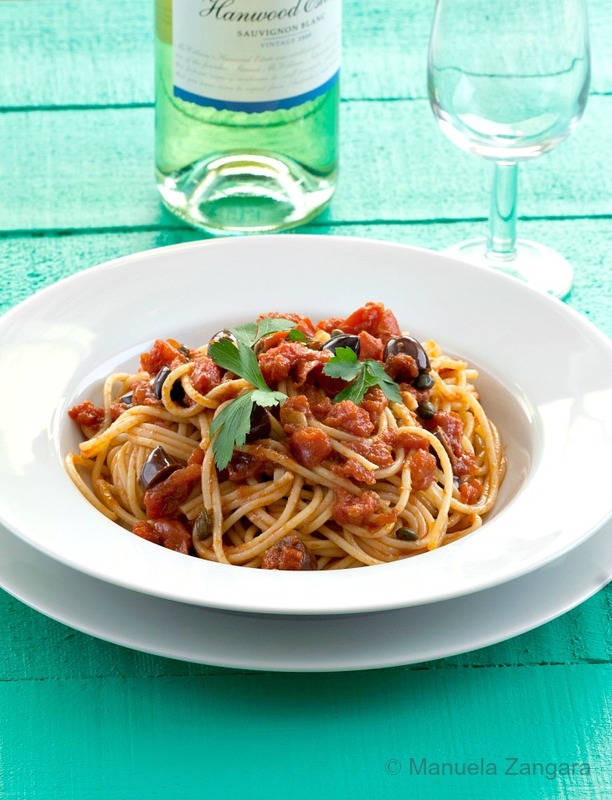 When we were living in Italy, we used to eat pasta once a day… almost every day. Yep, that’s the way Italians do it. But after moving to Australia, we don’t eat it quite as often. Still, I love cooking pasta and it is my “go-to-dish” for busy days, especially during the week. Today’s recipe is a classic of Italian cuisine. It is very famous in Italy and it originates from the regions of Campania and Lazio (where Naples and Rome are respectively). The name literally means “spaghetti a la whore”… but in Italian we also say puttanata (which derives from the Italian word for whore – puttana) to describe something worthless. It appears that the name derives from this second meaning as it is a dish made with simple and humble ingredients that everyone has in their fridge/pantry and that are often left overs. So it is a very quick and easy recipe… perfect for a quick meal. 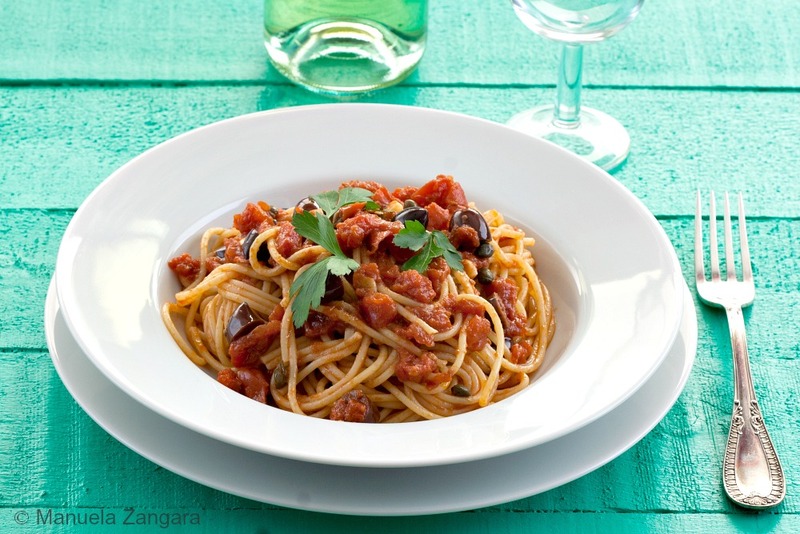 It is one of those recipes that Italians use for spaghettate. Ah, there goes another funny term. 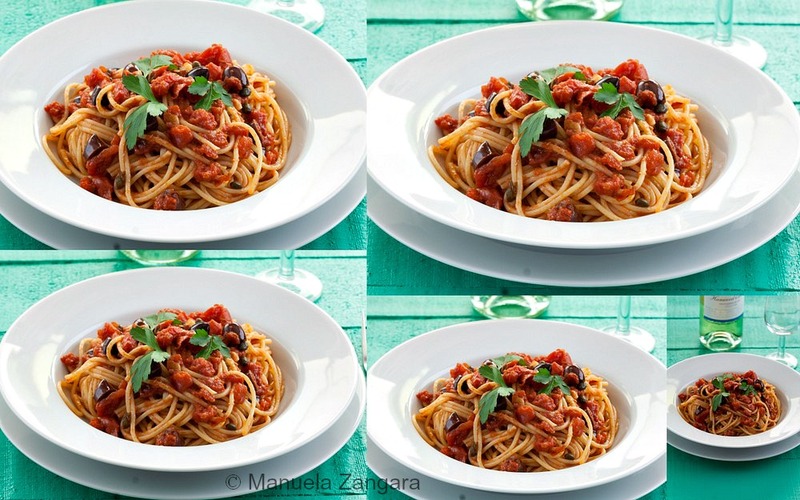 A spaghettata is a very quick meal (usually, but not necessarily made with spaghetti), that you put together at the last minute for unexpected guests. This recipe is always a hit, as it is delicious (and vegetarian too, so it is a crowd pleaser). I am sure this is going to be a very useful recipe for busy times, so make sure you bookmark it! Enjoy and don’t forget to check out my other Regional Italian Recipes! 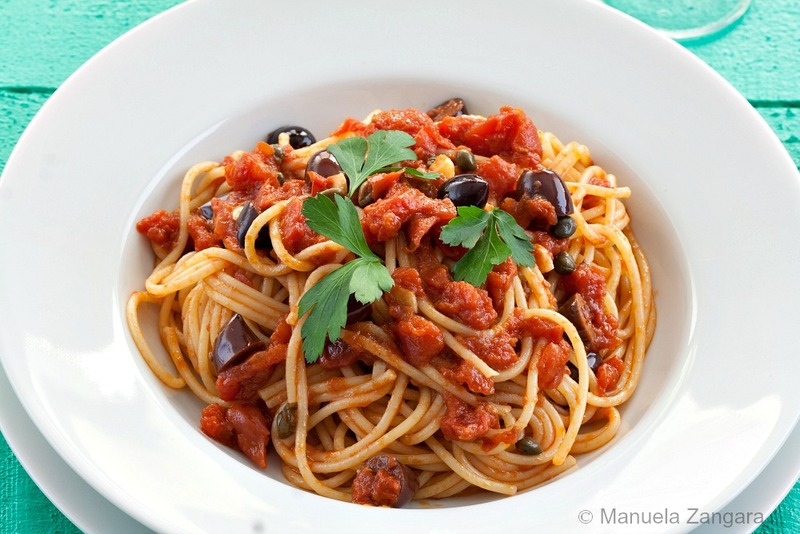 The recipe for a classic Southern Italian dish: Spaghetti alla Puttanesca, made with tomatoes, olives and capers! Put the extra virgin olive oil, chopped garlic, chilly flakes and anchovies in a pan. Sauté on a medium flame for a couple of minutes, breaking the anchovies with a wooden spoon so that they melt. Make sure the garlic doesn’t burn or your sauce will become bitter. 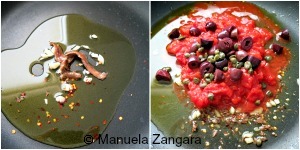 As soon as the anchovies melt, add the tomatoes, black olives and capers. If you are using fresh tomatoes, you may have to add a little water to help the sauce cook. Cook for 10 – 15 minutes on a slow flame, then put the fire off. In the meantime, cook the pasta following the steps on How to cook pasta “al dente” in the Techniques page of this site, but drain it 1 minute before it is cooked, as it will finish cooking together with the sauce. Put the drained pasta in the frying pan with the sauce, add the chopped parsley and mix it well while cooking it on a slow flame for 1 or 2 minutes. Serve immediately and eat hot! What a gorgeous puttanesca! You photo makes me want to devour it all, even if I’m trying to lower my carb intake… very hard for those of us of Italian extraction! Thanks for clearing up the origins of the name. Makes total sense for a dish that is made up of humble (but delicious) ingredients. Pasta is also my go-to dish. When my kids are hungry and I’m short on time – it’s pasta night. Thanks for sharing this gorgeous dish Manuela.